Seated in lalitasana (one leg folded and one pendant) on a double-lotus base, Tara embodies serenity. She has her left hand raised in vitarkamudra, and her right hand lowered in varadamudra. She is dressed in an ankle-length dhoti incised with a foliate pattern, an exuberantly decorated belt, and a sash that curls around her shoulders and arms. She is adorned with elaborate jewellery with semiprecious stone inlays, including a majestic tiara surmounting her hair tied in a chignon, and other adornments in her ankles, arms and wrists. Her features are marked by intense beauty, with almond-shaped eyes with incisions topped by bowed eyebrows and a centred raised urna, a delicate nose and small lips gently forming a smile. Her expression is of compassion, emphasised by a subtle torsion of the head and body to the side. 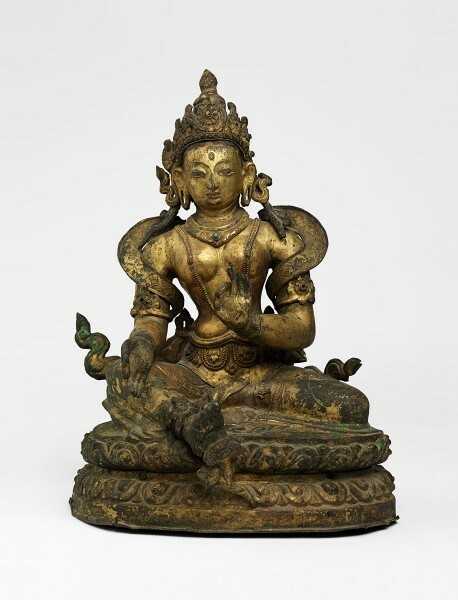 The present figure of Tara is made of gilt copper repoussé, a technique by which the sheet of copper was hammered from the reverse, to form the intricate shapes of the figure.